So over the years I have taught myself, and designed a system for avoiding having to spend considerable money on repairs! In fact, because my computer is often on from 7am ish to late… I used to pay out £100’s of each year on these! Additionally, I found 4/5 technicians were not actually that good, and you are better usually doing it yourself in any case! Hope they help, I just thought rather than dismissing these entirely, they may just help someone!!! Obviously the last resort is fully reinstalling the entire software, but I do believe the steps will not only save money, but have proven to save much time. From the least Invasive to larger More Comprehensive Steps. Check the second box here – Disk Defragment. 6) Possibly turn off system restore, and do a virus scan. Beware you will lose your restore points, if you follow this course of action, but virus have been know to be caught up in this mechnism, so as a last resort – it is worth turning it off perhaps and scanning. Backup & save all My Documents and Word Prog’s to memory sticks. Save any Documents on the desktop, such as maps and info. Save AOL PFC & Favourites if necessary. Save all Drivers on Driver Max if possible for easy reinstall. See instructions but select the 2nd repair option – on placing the Windows disc in, and switching to safe F5 mode. 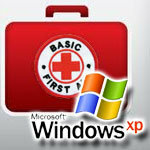 7)	Full reinstall of windows XP… see instructions. tips computer tips, Microsoft Windows XP, XP tips. permalink. To Leslie Buchanan- I think it would mean follow the on screen instructions which appear when the computer is booted from the XP system disk. Every few months I clone my hard drive. This way I do not have to reinstall and if one drive fails I do not lose much. If you still use XP it is time to upgrade. Forget about fixing anything and move up a step. When XP was released a good PC cost 3 to 4 times what it does today. Not only that but all modern software (your browser?) are not going to run and if they do will not run well on something as old as XP. Running XP today is comparable to running 98SE around the vista launch. You are behind the times significantly and should move on to bigger and better things. But if you have an old machine for whatever legacy purposes you have this could be useful since XP support ends soon. I’ve been running the same operating system (XP Pro) since 2000 without a reinstall. It’s been through hardware failure file damage, viruses and a host of other nasties, new motherboard replacements, it’s currently at SP2 and don’t intent on going SP3, at least not on this machine, I’ve never lost a file, and I’m on it now replying to this. Wouldn’t you like to know the secret! i probably already know the secret,i have been using XP PRO for the same amount of time and have’nt really had any major problems.I intend to keep using it as long as i can. McAfee scan results had a big 5, flashed on and off so fast I didn’t see which kind of threat. Think I’m under attack, protection settings like “Turn On” Real Time Scanning keep getting turned off. Can’t post at some of my forums, CNET XP Forum, About.com Thyroid Disease forum by patient advocate Mary Shoman, maybe some others. Oh, and that pic of Adobe Flash Player wanting to store 10 KB is malware, right? You forgot to put a caption? Can’t download any Registry Cleaners, always a msg, “Your settings will not allow”, but I checked and nothing’s blocked. Facebook probably the origin of lots of problems since joining, but like it. I sometimes run both a MalwareBytes and McAfee scan, and the one included w/Windows, Security Essentials, won’t stay turned off, you know. Pls don’t post this at Facebook but TIA for any private advice by Email. …Have a set pf 8 Recovery Disks, but no Instructions. Where are the ones mentioned at end of "XP Repair" steps above? Thx. Have a set of 8 Recovery Disks, but where are the Instructions, mentioned at the end of the "XP Repair" steps above? If he means click on the system drive then properties then tools,there is still no boxes to tick. You can check the volume for errors or you can defrag. No Ticking. @Richard Remmele: Click My Computer from Start Menu, or double-click it from Desktop icon, then right click on the Local Disk (C:) drive, click on ‘Properties’ and then on ‘Tools’ and you will see those options.